The city of Vincennes is rich in history. 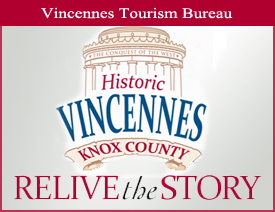 As the oldest city in Indiana, previously a French fur trading post, Vincennes has been at the forefront of the development of Indiana and the Midwest. Vincennes was founded in 1732 by Francois Marie Bissot–Sieur de Vincennes, a French military officer. This area was part of New France and the military post was built on the Wabash River to protect the rich fur trade here from the British. When the fur trade died out, this area turned to agriculture. This military post became the oldest continuous settlement making Vincennes the oldest town of Indiana. Forty Seven years later, George Rogers Clark and his small army took the largest land conquest in the revolutionary war away from the British in 1779. Greatly disadvantaged in number of troops compared to those inside Fort Sackville, Clark relied on the marksmanship of his troops and the ability to convince the British of a larger army to win the fort. Today, the George Rogers Clark National Historical Park in Vincennes is the site of the largest Memorial Monument west of Washington, D.C. which honors the heroic accomplishments of Colonel Clark and his men. The City of Vincennes is one of only 3 communities in the entire state of Indiana with a National Park within our city limits. In 1800, the Indiana Territory was formed and Vincennes, nestled along the Wabash River, became its capitol. William Henry Harrison became its first governor and then went on to become the United States ninth president. Grouseland, the home he built and the first brick home in the territory, still stands today and is open for tours daily. Vincennes was at the heart of many of Indiana`s firsts including site of the first Catholic church in Indiana, first county, first newspaper, first Presbyterian church, first Masonic Lodge, first bank and first medical society. In 1801, the Jefferson Academy was founded. Eventually becoming known as Vincennes University, this is one of the oldest institutions of higher education in the United States. Vincennes history is also rich in architecture. Many French influenced homes and buildings dot the city. Many of the buildings are built not only around pre-1900s but also closer to the beginning of the 1800s. For instance the Indiana Territorial Capitol Building, considered the oldest major government building in the Midwest, was built in 1805 as a tailor shop.Â Visit the Vincennes Convention and Visitors Bureau for more information. Vincennes has continued to be at the forefront of the development of Indiana and the Midwest and preserves the history and charm of a city rich in history.